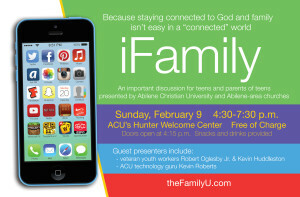 iFamily: Because staying connected to God and family isn’t easy in a “connected” world. 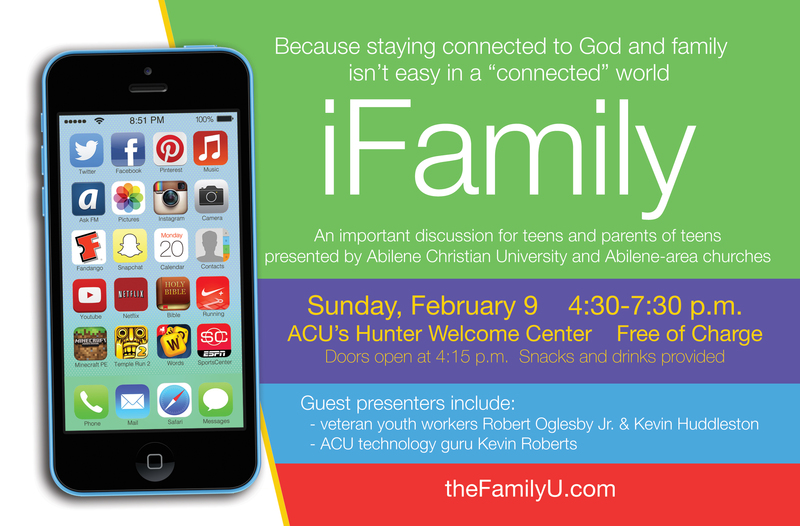 Join us for an important discussion for teens and parents of teens regarding how smartphones are shaping our culture from an expert in this field (Kevin Roberts). We will have an informed panel composed of teens, parents, college students & youth ministers that will tackle some tough questions posed by our audience members. We will also look for solutions to problems or parameters for smartphone use and celebrate the opportunities for God’s Kingdom that our new technology presents. On Feburary 9th, we will gather at the Bob Hunter Welcome Center with other teens and parents interested in taking an honest look at the “connected” lives we now live. Doors open at 4:15pm. We will kick off our evening with a time of worship at 4:30pm. After our “smartphone guru’s” presentation & our panel discussion we will take a short break for some refreshments and snacks provided by ACU. We will begin to wrap up our evening with a “Next Steps” session presented by Robert Oglesby Jr (Chairman of the Youth and Family Ministry Department of ACU) and Kevin Huddleston (veteran youth worker & a frequent presenter of issues related to youth culture and family). Our evening will conclude in worship to a mighty God that created us to be connected in relationship to Him and the people around us. Our families and teens will be dismissed at 7:30pm. 5:30pm Panel Discussion – Composed of parents, teens, youth workers, and “experts” (audience will get to ask questions). Let’s find answers and healthy solutions from informed people, our communities of faith, and within our own family. 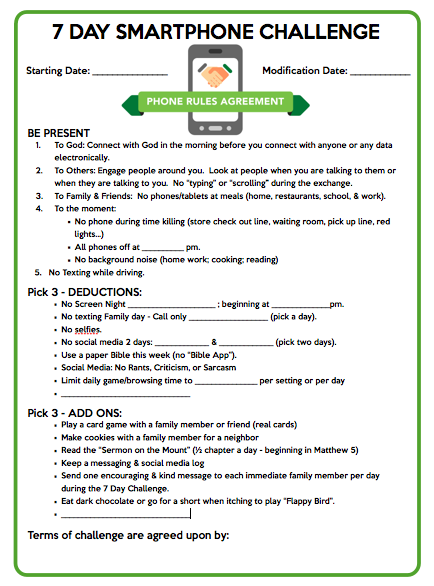 You too can take the 7 DAY SMARTPHONE FAMILY CHALLENGE. Click HERE to learn all about it!